Often students who have difficulty writing in math class have less difficulty telling the teacher what they think. Capitalize on this oral strength by incorporating the think-pair-share strategy more often into math lessons as a prelude to writing. Think-Pair-Share: Some students are reluctant to write at first and benefit from practice sharing thoughts with a partner and hearing that partner put thoughts into words. Reluctant students get to "practice" in a small setting with a partner before speaking to the whole class. These students can also choose to share their thoughts, their partner's thoughts, or a combination of the two. Question: Ask an open-ended question and tell students that they will think-pair-share the answer. Think: Give students 1-2 minutes to think quietly about their response to the question. Walk around the room to reinforce this quiet, on-task response. Pair: Ask students to share thoughts with their partners and ask questions if they don't understand what their partner is saying. Circulate around the room, listening to student conversations. NOTE: It is not necessary and, in fact, it is usually not time-effective to have each group share. As you circulate around the room during the Pair share, identify students who have used different strategies or great models for thinking about an important concept. Call on these students or their partners to share with the class. Draw a picture and label. Create examples of the skill/concept and explain. Write about a real-life use of this math concept or skill. Connect the concept/skill to concepts/skills you already learned and use. Reflect on your understanding of this concept/skill on a scale of 1-5 and explain. Create a K-W-L chart of what you already know, what you want to know and what you have learned about the concept/skill. Students then share their written responses with partners during which time students might elect to edit their own written response, choosing to replace certain words with better mathematical vocabulary, or add ideas and statements from their partner's writing. Finally the teacher selects some students to share written responses with the class. This process encourages students to get something down on paper and allows them some editing functions through the partner pairing. 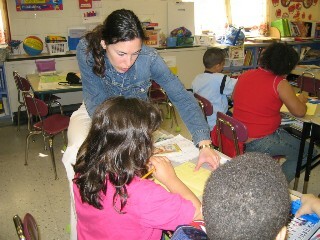 Additionally, students benefit from regular listening to classmates sharing their own writing. 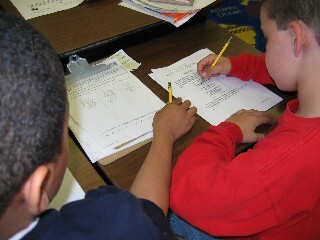 Students who work through these strategies start to make the connection that "what I think" is "what I should write" and this realization, along with posted prompts, helps reluctant writers get started on written expression of important mathematical concepts or explanations of their thoughts and problem solutions. Partner sharing and listening to classmates read their writings encourages editing and fosters the notion that math writing isn't perfect on the first draft. Sometimes it's just important to get some thoughts down on paper, but sometimes, as in responses to open-ended assessments, students must carefully check responses against rubric requirements. Saving writing samples in student portfolios will allow students to see their own growth over the course of the year and this practice helps students develop confidence in their ability to meet the demands of the varied writing assignments. See 10 Big Math Ideas to read why Marilyn Burns emphasizes the importance of writing in math class. Be sure to read #3 and #4. Math Journals Boost Real Learning offers practical tips on using journals, responding to student's writings and storing journals in the classroom. Read Math Out Loud for more reflection on the connection between speaking and writing. Check out Writing in Mathematics for some suggested ideas and prompts that promote different kinds of writing to make sense of mathematics. Math Journals and Other Math Ideas for Primary Teachers discusses the use of journals in the primary grades. Consult Why students should write in math class for Washington state's suggested guidelines. Options for Writing in Math presents a collection of suggested activities based on Marilyn Burns activities. Tips for Improving Student Writing offers additional strategies for working with reluctant writers. Reward the poets with an introduction to Greg Tang's Math Poetry as introduced in Poems in Math Class? Yeah, Write!. Create your own R.A.F.T.S. Prompts for Math Class provides an online generator for serious math writing for an audience. Refer to No Child Left Unheard: Improving Math Success Through Feedback Strategies for some great ideas for incorporating different kinds of writing in math class so that every student's voice is heard. Kay Tolliver makes a strong case for listening to students in Math and Communication. Many of the 59 Writing Prompts for Math Teachers could be adapted for student use. My Life in Math Class describes a beginning of the year writing assignment Brenda Dyck created that requires students to write a math autobiography to meet specified criteria.